Individually feed lambs/goats/hogs with our Feeder Pens. 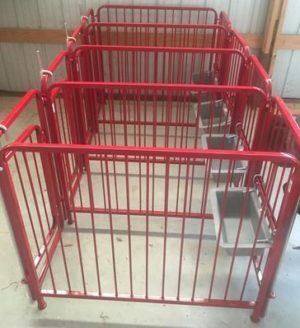 Each pen has a 40” tall, 24” wide gate with a lift-up latch to allow animals in and out of the pen and front panel with an adjustable bar to hang a feeder on. The side panels are our regular style Vertical Rod Panels and measure 40” tall and are 48” long. Utilize space in the barn by only having to set up the necessary amount of pens needed. When not in use, the pens can be disassembled and easily stored or the side panels can be used for other pens in the barn. Price per pen is discounted according to the number of pens purchased along with the optional 1 ft. Plastic Show Trough for each pen. Individual panels and gates may also be purchased. One Drop Rod is included per panel/gate.